The original cast of Four Saints in Three Acts, onstage at the Wadsworth Atheneum, Hartford, 1934. Photo: Harold Swahn. “STEINMANIA” SWEPT OVER SAN FRANCISCO during the summer of 2011, incited by two major exhibitions related to the writer“The Steins Collect: Matisse, Picasso, and the Parisian Avant-Garde,” at the San Francisco Museum of Modern Art, and “Seeing Gertrude Stein: Five Stories,” at the Contemporary Jewish Museumas well as a new staging of Gertrude Stein’s first opera, Four Saints in Three Acts, mounted at the Yerba Buena Center for the Arts (and sponsored by SF MoMA and Ensemble Parallèle). I went to San Francisco in August to introduce that production, Four Saints in Three Acts: An Opera Installation, and to talk about the work’s 1934 debut. Collaboration among artists is, today, such a common practice in Americaand has been for several decades nowthat it’s easy to forget how rare it was in the early part of the twentieth century. Four Saints, which paired the music of Virgil Thomson with a libretto by Stein, was the first large-scale American Gesamtkunstwerk, in the tradition of Wagner and Diaghilev. Recalling his first meeting with Stein in 1926, Thom­son said that the two got along “like two Harvard men,” but Alice B. Toklas seemed wary. Knowing that Alice was an accomplished musician and that Gertrude liked seeing her words put to music, Thomson decided to ingratiate himself to both women by setting Stein’s poem “Susie Asado.” “Gertrude’s words don’t lack music,” he once told me, “but they like music.” He delivered his score in person on New Year’s Day 1927, the same day Alice gave Gertrude the short haircut for which she would be known ever after. Thomson’s relationship with Stein flourished. A few months later, the composer proposed they write an opera together. Stein wrote, “Collaborators tell how in union there is strength.” Collaboration can be a career booster as well as a creative endeavor. In this case, Thomson had clearly hitched himself to someone better known than he. Stein also hoped to benefit. Although she had written dozens of plays, none of them had been produced. Perhaps an opera written with an up-and-coming composer would finally prompt a production. In 1927, Thomson and Stein decided on saints in Spain for their subject because it evoked Stein’s friendships with Picasso and Juan Gris and thus provided a locus of modernism. Stein admired Saint Teresa of Ávila as a strong and passionate woman, and she had given Toklas the nickname Thérèse following their honeymoon visit to Ávila in 1912. Once the subject matter was decided, Thomson and Stein operated on their own. Their collaboration was based on independent activity. Thomson didn’t step on her words, nor she on his music. After seven months, Stein delivered to Thomson a huge block of words without paragraphs or narrative. It did not suggest any specific characters, except Saint Teresa and Saint Ignatius. That these saints would never have met was of no importance to Stein. Thomson sat down at his rented piano at 17 quai Voltaire and improvised over and over with the words before him. When he liked the musical result, he wrote down the notes. The only significant alteration he requested from Stein was that he be allowed to add a second Saint Teresa, so there could be duets. She promptly acceded. On Christmas night 1927, Thomson performed the first act for Gertrude, Alice, and friends, giving them a “hell of a good supper” and accompanying himself on the piano by memory. The evening was thereafter informally called “the Paris production.” Within months, the opera was completed, but it would be six years before Four Saints in Three Acts was produced. During that interregnum, Stein entered into a collaboration with Georges Hugnet that suggests the perils of the collaborative process. Hugnet, a young French poet and publisher of a small press, Éditions de la Montagne, had translated excerpts from Stein’s massive novel The Making of Americans (1925) into French. Since his English was limited, the translation was completely literal. Stein appreciated his lack of interference with her words and called the translation “darn good”: She, in turn, translated, or rather created her own versions of, some of his poems, retaining the original French title Enfances. Hugnetwho didn’t understand the extent of her interventionswanted to credit her simply as the translator. Stein wanted the title page to read Enfances in the center, with “Stein” and “Hugnet” in identical typeface and size. Thomson tried to broker a settlement, but Stein and Toklas declined. Caught in the crossfire, Thomson was excommunicated. Below the “Miss Gertrude Stein” engraved on her calling card, Stein wrote: “declines further acquaintance with Mr. Thomson.” Stein’s versions of Hugnet’s poems were soon published (in 1931) as Before the Flowers of Friendship Faded Friendship Faded. Collaboration between words and music could work, but collaboration between French words and English words proved impossible. As the years passed, a production of Four Saints seemed increasingly unlikely, but Thomsondespite his falling-out with Steindoggedly persevered. 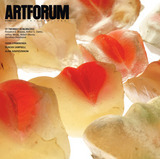 Funding was finally secured for the work’s premiere not at an opera house but at the Wadsworth Atheneum in Hartford, thanks to its visionary director, Chick Austin. Among the curiosities of that production was the fact that none of the key collaborators had ever worked on an opera before. As Thomson told me, “it was everybody’s first time.” Artist Florine Stettheimer designed the costumes and the sets, creating a cyclorama heaven of cellophane and feather trees. Frederick Ashton choreographed a few balletic dances and directed the movements of the entire cast. Thomson’s lover, Maurice Grosser, fashioned the text into a series of tableaux. Thomson himself assembled a cast of mostly amateur singers and, with Ashton, enlisted dancers in Harlem and led the rehearsals. Four Saints in Three Acts opened in Hartford on February 8, 1934. 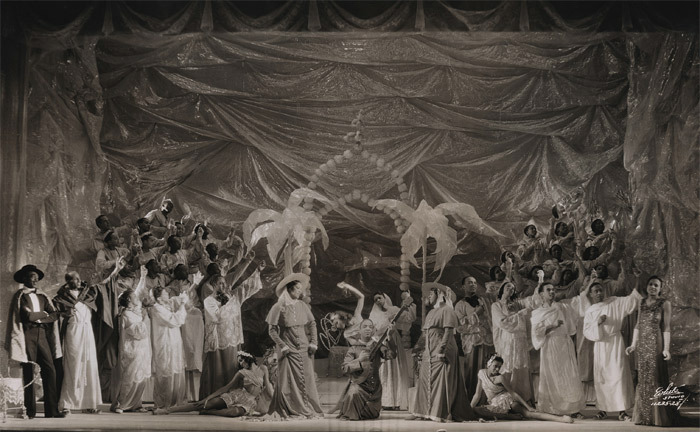 Two weeks later, the opera arrived on Broadway with an all-black cast at the Forty-Fourth Street Theatre, where it would become the longest-running opera in Broadway history (a record surpassed two years later by another all-black production, Porgy and Bess). Four Saints in Three Acts: An Opera Installation, 2011. Performance view, Novellus Theater at Yerba Buena Center for the Arts, San Francisco, August 8, 2011. Photo: Steve DiBartolomeo. MODERNIST COLLABORATIVE PERFORMANCES in the Diaghilev traditionincluding the Ballets Russes productions themselvestypically haven’t persisted in their original form. Parade, Erik Satie’s 1917 ballet with a scenario by Cocteau, choreography by Léonide Massine, and sets by Picasso, has enjoyed few reconstructions or revivals. Stravinsky’s groundbreaking Rite of Spring (1913), choreographed by Vaslav Nijinsky (with sets by painter and theosopher Nicholas Roerich), can still be found in the Joffrey Ballet’s repertoire. George Balanchine, who choreographed four of his greatest ballets to his compatriot’s music, considered that brilliant score undanceable, but others jumped in. Pina Bausch created a rendition in 1975 in which she covered her troupe in mud, and Molissa Fenley has repeatedly danced the score as a solo, titled State of Darkness (1988). And in 2009, the centennial of the Ballets Russes inspired numerous museum shows and performances in the US and across Europe (including, notably, a reconstruction of L’Aprés-midi d’un faune by the Bayerische Staatsballett in Munich). But these are the exceptions that prove the rule: The Diaghilev tradition is history. Four Saints, to the contrary, remains eternally in the present. There can be no “revival” of Four Saints, because there is no obvious original to revive: The work is malleable. Stein’s words and Thomson’s music are, of course, mandatory for any production, but the style, the choreography, and even the scenario are up for grabs. I have seen Four Saints in an Upper East Side school, in a church, at the Brooklyn Academy of Music, at Lincoln Center’s New York State Theater, on the crowded stage of CUNY’s Martin E. Segal Theatre. Robert Wilson directed a glacially slow production, and Mark Morris created an ebullient dance piece with singers and orchestra in the pit. The recent San Francisco production of Four Saints by Ensemble Parallèle was billed as An Opera Instal­lation. It would present not only Thomson’s truncated “Oratorio” version but also a sort of prologue using the excised Stein words, with new music by Luciano Chessa and video projections by Kalup Linzy. This curtain-raiser, A Heavenly Act, is in the spirit of the original collaboration, updated to involve current creative circles. The program notes provided a scenario that I would not have gleaned from the performance. Stein’s words are mostly muttered, in an inscrutable word collage. Chessa’s often beautiful music remains independent from the words instead of serving them. A Heavenly Act is foreboding in the worst sense, presaging a long evening in which everyone in heaven will move very slowly and no one will understand what is being sung. The words and music of Stein and Thomson, it is proved once again, float freely above any scenario essayed. In 1934, Carl Van Vechten asked why the audience should demand a plot at all. “It is like looking at a painting and demanding a story,” he jibed. 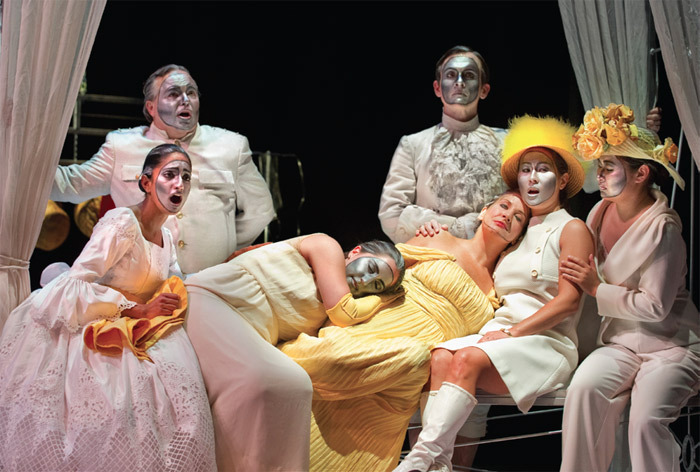 Decades later, Robert Wilson noted that, for his part, he thought of Four Saints as “a meditation on the joy of life.” The most recent production encompasses that joy and, with considerable humor, the inevitability of death as well. “The Steins Collect” is on view at the Réunion des Musées Nationaux-Grand Palais, Paris, through January 16, 2012; travels to the Metropolitan Museum of Art, New York, February 21–June 3, 2012. “Seeing Gertrude Stein” is on view at the National Portrait Gallery, Washington, DC, through January 22, 2012. Steven Watson is the author of Prepare for Saints: Gertrude Stein, Virgil Thomson, and the Mainstreaming of American Modernism (Random House, 1998), among other titles.